When I was looking in to resource which tells about OSGi Service Properties I found very little useful articles. Most of the resource just describe how to write services and consume them and they just mention we can use properties to varies different services. You might not know what OSGi properties yet,first I will show you how to write a typical OSGi service and register it in to the framework, then let's look in to how do we have to deal with Service Properties. Before writing a real service we always have to have an interface of that particular service, then we have to implement our interface.Let's assume the Interface name is Calculator and implementation class name is CalculatorImpl. Then we have to register our service using a class which implements BundleActivator class. Normally when our bundle get resolved start method of that class get called. So normally we have to register our services during the activation of our bundle. So we have to do the registration inside the start method of the Activator class of our bundle. Then we have to write another class which is in another bundle and get the service reference. In order to do that OSGi API provide number of ways, here I will be showing the very basic way of consuming a known service. Here the registration happens with registerService method of BundleContext object which is the object we always use to talk to the OSGi environment. In here you can see we are registering the service by giving the interface name, object of the service class and a null value. Second argument is the Service object which is going to use by the consumer. Before going in to the last argument I would like to remind you something which I have mentioned in my blog post about of Introduction to OSGi Services. Here I have mentioned that we can register different services which implement the same interface, as an example we can write another class which implements the same Calculator class. So during registration of process we give the same full qualified class name. So you may get confused how do we the exactly the same require object when we get the service because when we get a service we again pass the interface name rather parsing the exactly implementation class name. So that is the place where we have to use Service Properties to get the differentiation of the services which implement the same interface. As the third argument for the registerService method we have to give a Dictionary type object and normally what we are doing is create a Properties object and put required values to identify our service from the services which implement the same interface. So once you give the Service properties, during the consumption you can check these properties using Service Filters to get the the exactly the required Service object using getService method by passing the filter. As an example if we want to get the service object of the registered service above we have to give the filter string like this. This will simply return the actual CalculatorImpl object. When you give the filter Strings you have to obay certain rules whey you deal with complex filters and I will be writing more about OSGi Service Filters which will be helpful for you to use OGSi services in effective manner. Recently I'm doing some work at WSO2 with OSGi Services and I'm reading some OSGi books which is very interesting for a typical Java developer. So I thought of blogging little by little about what I'm learning by reading about OSGi since there are little number of resources to read about OSGi in the internet. In simple OSGi Service is again a service which we expose using a Java class as we do in a typical Web Service, but here we have our consumers run in the same JVM and message parsing happens through the same JVM, so no remote calls at all. With OSGi services it contains it's own way of handling clients and it's own way of handling consumers of the services like we have in Web Services. In web services we should have a framework to process web service calls and with OSGi services we have to have the an OSGi framework running to consume and expose OSGi services. We can write a simple service interface first and implement it in a class and register the service.You can register different number of services by creating different implementation of the same interface. In OSGi we keep all the service information in a Service Registry and when someone wants to consume a given service it actually talk to the Service Broker which is aware of the OSGi registry. Through the service Broker it connect with the service and give a reference of the service object, so that we can call appropriate methods in the service class. Instead of just consuming service operations OSGi services provide set of features like monitoring service registration and unregistration using different approaches. So we can do certain things while a particular service register and while a service is unregistering. I will be writing more on how to register a service, consume a service and how to track service life-cycle, how to use service properties to select required and how to use filters with OSGi Services. I hope to write on those things in few blog posts rather writing all together. I think before we write complex Java programs we should have a basic understanding about how JVM works and class loading is one of the important thing which JVM does during running of Java programs. In typical Java programs we are using hierarchical class loading concept. In berief class loading is basically contains two operations which are locating the class in the file system and convert physical bytes in to Class object. We can overwrite the first operation by extending java.lang.ClassLoader but we cannot change the way conversion of physical bytes in to Class object. When we run a normal Java application we have to give the classpath value for our Java command and it's the place where we have our Jar files. So that is the place where we start our class loading. JVM reads paths according to the given order and it's directly goes to the first place which is called Application Class Loader. Since the Java class loading is heirarchical, before loading the class by itself it delegate the work to the upper layer called Extension class Loader and before doing any work Extension class loader delegate the work to Bootstrap class Loader. This concept is called parent first class loading. 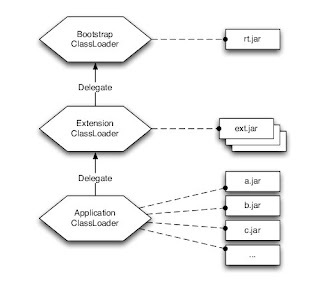 So when we try to load our own Jar, Bootstrap and Extension is failing to load the class because Bootstrap is aware of classes in JRE library or extension of JRE class and Extension class loader is aware of libraries in extension directory and finally class loading happens in Application class loader. Recently I bought an amazon kindle since Amazon recently started on shipping to Sri Lanka and I thought of writing some information on behalf of the Sri Lankans who are going to buy a kindle from Amazon. First I would say that shipping service is excellent and it shipped directly to home on exact date they mentioned, but if flights get delayed it will prolly delayed and you can monitor the shipping progress via amazon since they send us an email once they ship it from there. Sad news is once we take the kindle from DHL we have to pay a tax of 2602 Rs and if you are buying a kindle Leather cover you have to pay another 319 bucks as well. I would like to first talk about the price, if you are buying a new amazon kindle you have to pay 259$ for the kindle and if you are thinking of shipping it'll cost you 20$ and if you are buying a leather cover it will cost 24$. so including taxes from Sri Lanka total cost would be roughly 332$. 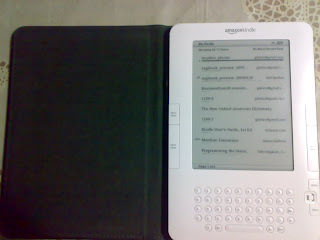 I would recommend to buy a kindle leather cover since it will be really really useful for smooth usage for the device. When we talk about features first I should say that if you live in Sri Lanka you will not be able to access internet since Kindle network is not support in Sri Lanka because they do not have a partnership with any Sri Lankan 3G service providers yet. But I cannot say this is impossible since you can try to replace the sim card in the kindle (Kindle is having a built in HSDPA modem with a built in AT&T Sim card) modem and change the Access Point some how (that is what I'm searching these days) and use it in the normal way we use our 3G internet connection. But I still do not have a solution since I'm bit scared to open up the kindle back cover :). Still I love it once I feel i should open up and try to do something I will do it but I hope amazon will support the Wireless support to Sri Lanka soon. But even though you can still use kindle to read books which is a very cool experience and I would say that it will prolly increase the number of books you read. What you have to do is you can get the books pdf versions or any other kindle supporting file format and convert it in to kindle version by sending an email to "username"@free.kindle.com with attaching the document. It will send the document converting to the kindle version to you email, in few seconds so you just have to get the document and copy that to you kindle using the kindle USB cable. The new kindle is supporting the PDF files but I'm not that happy about it, because of the font size and page seperation issues. So the best option is to use free amazon conversion service but some of the images get completely black during the convesion and you have to be bit patient in those situations. But if you are reading story books instead of techie books it will work fine for you.But still I would say this will be a cool experience and good chance for you to read more and more books, during you travel by bus and when you feel unhappy reading at the computer. Reading experience with the kindle is great and it's screan is very much like a typical paper, since it doesn't have back light. No pain for eyes even if you keep on reading for hours. Important thing I'm seeing here is you can read in any place. If you fed up staying in your chair you can go to bed and start reading which is hard to do with your laptop,and if you want you can read in any place at your home and it will be a good hobby for you to use it during weekends. If you travel long way to your job you can keep on reading in the bus of if you are a person who travel during weekends it would be great to bring your kindle with you and read a bit. If you are a person who hate reading ebooks this is the ideal solution for you to buy an amazon kindle even thought it's an ebook reader, you never feel that you are reading an ebook, it's very much like a normal book. I will be writing some more about the kindle in future, hopefully if I find how to crack the kindle HSDPA modem to work in Sri Lanka, I will prolly blogging, so keep in touch. Still it's amazing for me and it's really improving my reading ! The best practice is to ask this question in the morning/evening and tonight. Why did I born ? Birth and death is almost a single thing and obviously there's no existence of one thing without the other one so we can consider both together. People used to cry so much when someone die but it's a joke to cry when someone die because we all know when someone born they'll die so the best time to cry is when someone born. Are we in a position to understand this ? Can we live in a closed room for few hours continuously without doing anything? It's would be a very ugly experience for us but how do we feel when we stay in our mom's body for more than 9 months ? But still we want to have another birth .. We were born to stop another birth and the answer for the question "Why did I born? Stop another birth." Translated from "Ajan cha natha"
We are working on making WSO2 Governance Registry Multi tenant so that users can use it more convenient way rather setting it up in their own environment and configure it. Now we can have a single instance running of WSO2 Governance Registry and allow so many organizations to use that instance by completely separating data between those organizations. Each Organization is having their own tenant and set of users for each tenant and all the data between users and between tenant are successfully separated in database level. We are almost done with new big feature with our Governance Registry and we are about to host it in an Amazon Cloud so that all the users can easily access it create your own tenant and add users to it and all the users can login by giving tenant domain name and user-id. Please wait until we host it during upcoming week ! If you are using WSO2 Governance Registry 3.0.0 you can see that we are allowing users to create their services as resources by giving different kinds of information about the resource. If you go through the context sensitive documentation by clicking on the help button when you go the add service UI you'll get to know that you can configure the given UI by giving different values for the already provided UI by changing some XML files located int /governance/configurations directory. Now we are allowing users to create their own fields in to govenance registry Service UI form so that you can have your own data in to service resources. This is a completely dynamic UI generation based on an XML. You just have to change an xml in the registry and change your Service UI dynamically. If you want to get this feature in you can do that by switching in to upcoming release of WSO2 Governance Registry 3.0.1 and download the patch here and go through the readme on how to apply the patch to registry. WSO2 Governance Registry is providing complete Service Metadata Management features with Release 3.0.0 to do a better governance in your SOA system. In the new left panel there are set of operations supported in order to manage service metadata efficiently. We are providing two main operations to manage service metadata in order to do a better governance in users SOA(Service Oriented Architecture) system. Users can add it's service details in different ways like importing complete set of service details, importing WSDL of set of services in the SOA system, importing Schema's or Policies of set of services in the SOA system. Importing service details can be done using the upper part of the metadata menu which contains the links Add->Service, Add-Policy, Add->WSDL, Add->Schema. This service import method is preferred when user doesn't have a proper description about the service with a WSDL but we provide a field to import WSDL in to Governance Registry. When user click on Add Service link user will be given a form to fill. Important thing in this form is user can simply reconfigure the default configuration. User can configure the set of drop down lists which suit to users SOA system. This can be done by changing the current configuration by editing the content of set of resources in /governance/configuration/. There are set of resources as displayed in Figure 3 which you can browse and edit the XML content of the resource. After adding new XML element save the content and to find the change, go to add service UI and see the states drop down. Likewise users can configure all the drop downs in the add service UI.Likewise users can configure all the drop downs in the add service UI. In Add Service UI there are set of fields to fill and service name and service Namespace are mandatory. Most of the fields are obvious service informations and if you want to add a WSDL URL you can add it but the information from the WSDL will not be display when you go to edit these information. So we prefer you to use add->WSDL if you have a WSDL in the given resource. And you can add any number of endpoints to the given service by clicking add endpoint link and if user try to add more and more endpoints without filling previously added endpoint new endpoint will not be displayed. After successfully adding a new Service user will be directed to newly added resource location which constructed based on the service Namespace which user shouldn't concern about. After direction user can see a resource with the given service name and if user give already exist service name service import operation will fail. User can add Policy by traversing to the add Policy link. This form contains fields, policy URL and policy name. Governance Registry will automatically suggest a name for the policy once the URL is entered. Policy will be imported as a resource in to the Governance Registry. Successful import will redirect in to a page which list all the imported policies. If a WSDL URL is available and you need to import service information to the Governance Registry you can use the "Add WSDL" option provided with the Governance Registry. Once the URL is provided to the UI, a name is automatically suggested for the resource in Governance Registry. When we import the given WSDL we are extracting certain number of details like service name, service namespaces and service endpoints and import the given WSDL as a resource and import a service resource which is very similar to the resource we are creating when user add a service using add service UI. So user can go to that resource and edit the rest of the information user couldn't import through WSDL import operation, like Authentication Platform, Authentication Mechanism etc. Like WSDL importing Governance Registry allow users to add Schema in to registry using add Schema UI. User have to give the schema location in to Schema URL and Schema name will be filling very similar in Add WSDL and Add Policy forms. Successful schema import will redirect in to currently available imported schema listing page. Similar to WSDLs, WSO2 Governance Registry performs Schema validations on the wsdl provided once importing is done. The result is displayed under "properties" section of the imported Schema resource. I'm thanking all of them who helped him to become a graduate..and wishing him all the success for his future endovours !!!! I think he's going to get another degree in couple of months and will be posting again on that !!! Today I bought an Airtel Data bundle and tried to configure it on my Ubuntu 9.04.I have been accessing internet through my Mobitel connection for sometime and I thought it would be easy to configure it to Airtel.Yes it was easy but I had to do couple of things since the debian package did not had Airtel information in Sri Lankan service providers list. If you are a user willing to configure your Airtel HSDPA(Sri Lankan) connection on Ubuntu with your mobile this blog is for you. 3. You can see a computer at the panel which show the status of the network, right click it and select edit-Connections and select Mobile-Broadband tab. 4. If you have already define one connectioin please remove it and add a new one. After copying that new file it will show you Airtel as a Sri Lankan Service Provider during the wizard. As a developer from a company which uses OSGi for most of their products I thought of discussing the problems we are having with typical jar files. Most of those issues are solved in OSGi Environment.Don't think twice OSGify your products to achieve real modularity for your software. With typical jar files if we have different versions of the same jar it will just pick the appropriate class from the classpath according to the order we are specifying the classpath, so we couldn't consider this as a proper versioning system. Next issue I would discuss is lack of dependency information in a single jar file. Most of the jar files are always depends on other third party jar, but we do not have any proper way of keeping that meta data describe the dependency for a given Jar file. This cause people to get a very popular Exception called ClassNotFoundException. Keeping only the dependency information in not enough, we should have a proper understanding about the versions of those dependencies otherwise we couldn't guarantee the behaviour since different versions could be having different behaviours. So with the dependency we should have the version information included on it. I have described couple of issues we are having with typical jar files and I will be blogging on how OSGi(Open System Gateway initiative) is going to solve almost all of the above issues and Lead Software Development in to new Modularity concept which will be an elegant feature of Java world. Since I was assigned to work with Registry team at WSO2 I had a look in to the Registry Core source code which ships as a separate bundle with Carbon. I read the code from the Declarative Service level code and thought of blog about the Registry Initialization. Since this is a bundle of Carbon Environment it calls most of the methods of OSGI(Open Services Gateway Initiative) but other than calling them all the initialization happens inside the start method of the bundle itself. At the very first stage it will create the class RegistryConfiguration which mainly go through the carbon.xml and find what type of initialization is configured. It could be a Remote Registry or an Embedded Registry(Default Initialization). If it's a Remote Registry users have to give the values for following parameters like URL,UserName and Password in the carbon.xml.After reading carbon.xml it simply validate the configuration and create the RegistryContext object by reading registry.xml and passing RegistryRealm object in to RegistryContext. Almost all the initialization happed during the time of creation of RegistryContext. Major tasks are reading registry.xml and registering Handlers and configurating most of the database configurations in programmatical stage. After initializing the registry service based on the carbon.xml it add it to carbon environment by calling addCarbonRootCollection method and now RegistryCore is up and running in Carbon Environment. In the latest trunk all the bundle initializations are done using Declarative Service and you won't be able to find Tracker Classes or Activators any more in Carbon platform. I will be writing more about the structure of the Registry-Core in near future since it could be useful to understand the internal implementation for who ever is going to implement their own repository management system. I have developed a web Service and generated the code for the client side. If you have a look on my JSP code it's calling the method getProfile by passing arguments path,data,session. My requirement in this method is calling the web service client and get the output of the Web service in to the variable data. When I debug the class GetProfileUtil I notice the expected behaviour of variable data but when the JSP runs it throws a Null Pointer Exception when call the get method of the data(Map>). So the modifications happen inside the method getProfile to the variable data is not visible to the JSP. But when I modify my method like this to create the object inside the method and return it, it worked fine. I simply avoid passing the variabl in to the method getProfile but rather create a data variable and return it. when I access the bean variable I got all the modifications happen inside the method. Is this the typical behaviour of JSP's and it's totally different from the way Java hadle object passing between classes and methods.